In the Superyacht supplement to no. 494 of Nautica Magazine I talked about Planing Hulls, but the space available did not permit me to talk about a kind of Planing Hull called "Variable Geometry Hulls". 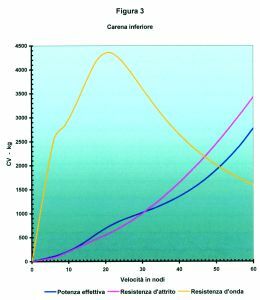 First of all, I must say that the name "Variable Geometry Hulls" does not mean hulls with a variable deadrise from bow to stern, but hulls the wet surface of which is different at a given speed V - i.e. before reaching speed V, the width of the wet surface is X1, while after reaching speed V the width of the wet surface is X2, narrower than X1. The idea of realising a hull of this type resulted from a request made by Mr Sergio Sonnino Sorisio, owner of the Italcraft Ship Yard, and it certainly was not his first and only request that caused animated discussion. He wished to build a very comfortable and spacious motorboat, approx. Twenty metres long, having a speed of over 50 knots, which could also cruise at low speed. 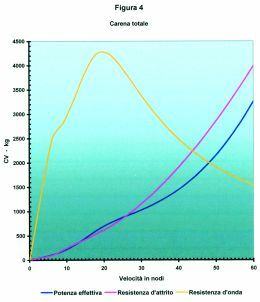 Yet, fast boats have narrower hulls than slow boats of similar geometry therefore not only do they have a smaller volume but also a higher planing speed. As a matter of fact, fast boats are not suitable for low cruising speeds. Because of the above parameters Mr Sergio Sonnino Sorisio's request implied contrasting aims. The desire to meet Mr Sorisio's almost impossible request led to finding a solution by creating a "Variable Geometry Hull". 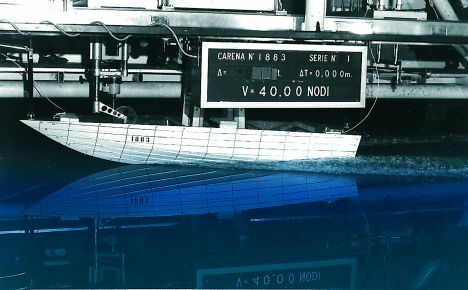 This hull is made of two overlapping bottoms with different deadrises, so that at a certain speed the upper bottom rises completely out of the water, leaving in the water just the lower bottom with the narrower chine thus reducing the friction as shown in Figure 1. The deadrise of the upper bottom is a function of the angle of the lower one and of the boat's speed. 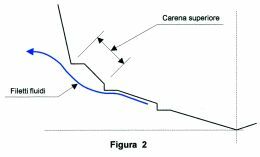 This may be explained by the fact that the water flow detaches and moves away from the lower bottom depending on the deadrise and on the boat speed as shown in Figure 2. Having perceived the feasibility of the idea, I started studying the hull shape. After several attempts, I designed a hull bottom with an overall length of 20.10 m and a breadth of 5.25 m.
Calculating the resistance was more complex. 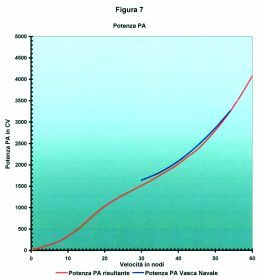 First of all I calculated the drag on the lower bottom and obtained the frictional resistance, the wave resistance and the effective power for different speed ranges between 0 and 60 knots as shown in the graph in Figure 3. Then I calculated the resistance of the combined hull bottom, considering it to have a chine width equal to that of the upper bottom, and a deadrise angle calculated according to the influence of the underside of the two bottoms with their respective deadrises, for speed ranges between 0 and 60 knots, as shown in the graph in Figure 4. In the 45 (speed at which the upper hull would definitely be out of the water) -60 knots range the AP curve would have perfectly superimposed the curve of the lower part in Figure 5. In the 30-45 knots speed range the AP curve would have maintained an almost intermediate course between the two curves in Figure 5. Fitted with two 1640 hp MTU engine, the boat should have reached a max. speed of 55 knots. 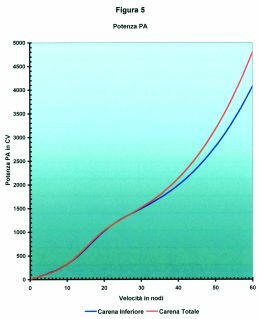 The resulting power curve obtained following repeated trials in the testing basin, as indicated in Figure 7, confirmed the power curve shown in Figure 6, as demonstrated by comparing the two above mentioned curves. Moreover, trials showed that at 42 knots the upper hull bottom was no longer wet by the water. A further confirmation of the advantage of this type of hull, at a speed of 55 knots, is a decrease in engine power AP of about 14%, as shown in Figure 5. 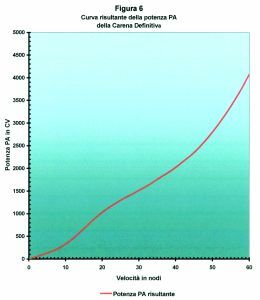 The above conclusions were confirmed by sea trials during which the boat reached 54.7 knots with equal load. The project's validity was also confirmed by two IMI engineers who are professors from the Genoa University of Naval Architecture, who profited from the study for it was considered a research project. The spirit of research and stimulus that the brothers Mario and Sergio Sonnino Sorisio have always put into running the Italcraft Ship Yard has stimulated their personnel in each sector of the boatyard to continually bring new ideas to life. I think that there is nothing more wonderful or stimulating than breathing life into one's own ideas!